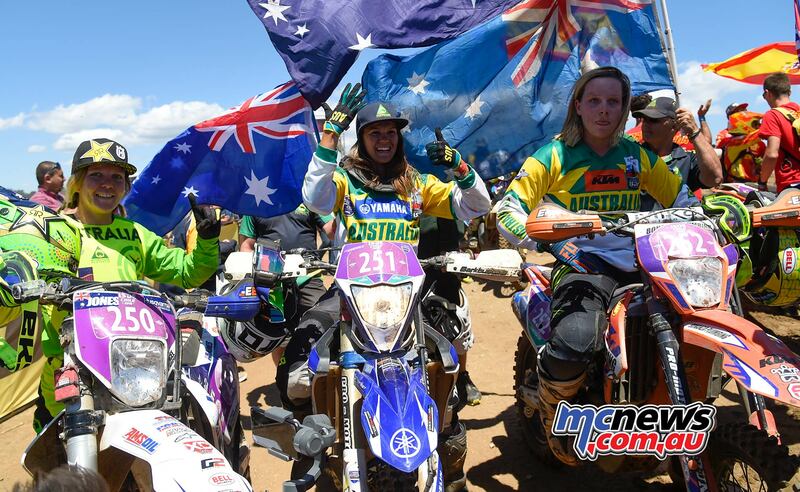 In conditions similar to the A4DE at Cessnock earlier this year, Australia’s World Trophy Team and Women’s World Trophy Team have sliced their way through the hot and dusty conditions to take their respective class wins at the 2018 ISDE in Chile. 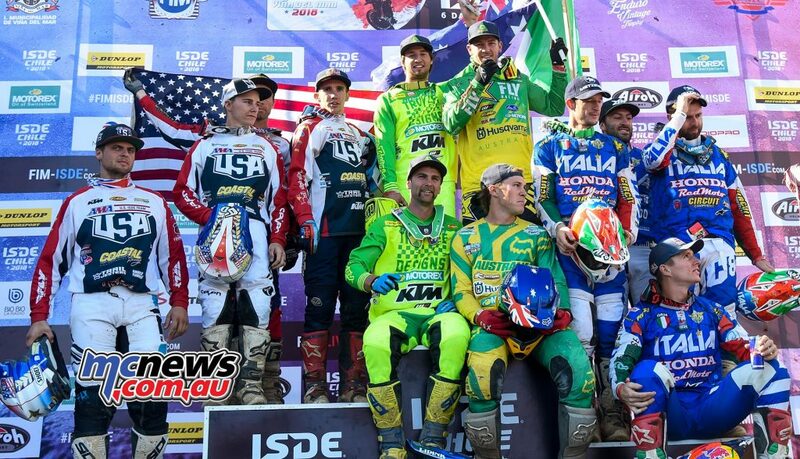 After five days of deep ruts, rocks and bulldust, Australia entered day six with a nine minute lead over their closest rivals so with Italy and the United States fastest at the final motocross race, Australia played it safe and crossed the finish line third overall which was more than enough to wrap up the FIM World Trophy Championship. Milner and Daniel Sanders went 1-2 at the Cessnock A4DE and this wasn’t far from being repeated ahead of the best riders in the world with Milner winning the coveted overall at the ninety-third edition of the FIM ISDE while Sanders was pipped by 8 seconds for second overall by America’s best at the event in Taylor Robert. 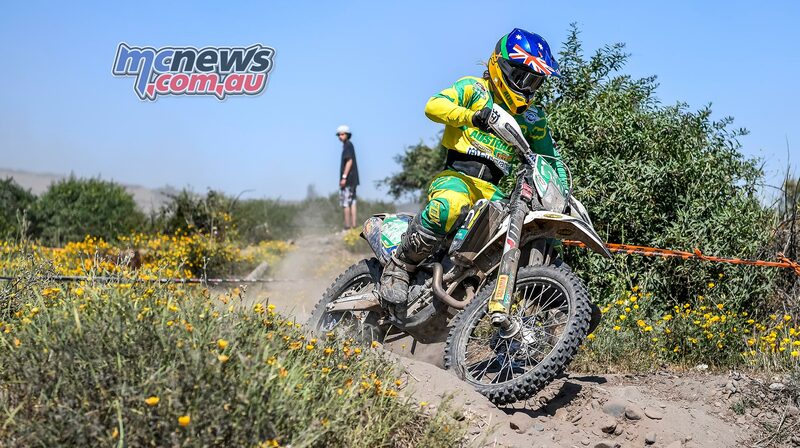 With Lyndon Snodgrass forced out with a mechanical issue early in the event, Australia could not afford another rider to faulter so Josh Strang played his part perfectly with the Husqvarna pilot finishing fourth outright in the E2 class and tenth overall – a truly world class performance. 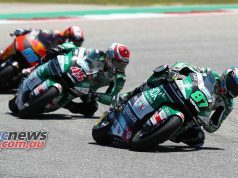 The United States had to be content with the runner-up result for 2018 with Italy completing this year’s FIM World Trophy podium in third, while out-going champions France finish fourth, with Spain, Portugal, the Czech Republic, Sweden, Chile and Germany rounding out the top ten. The Australian Women’s World Trophy Team won their sixth consecutive world title by over nine minutes ahead of Team USA while Spain, France and Sweden rounded out the top five. 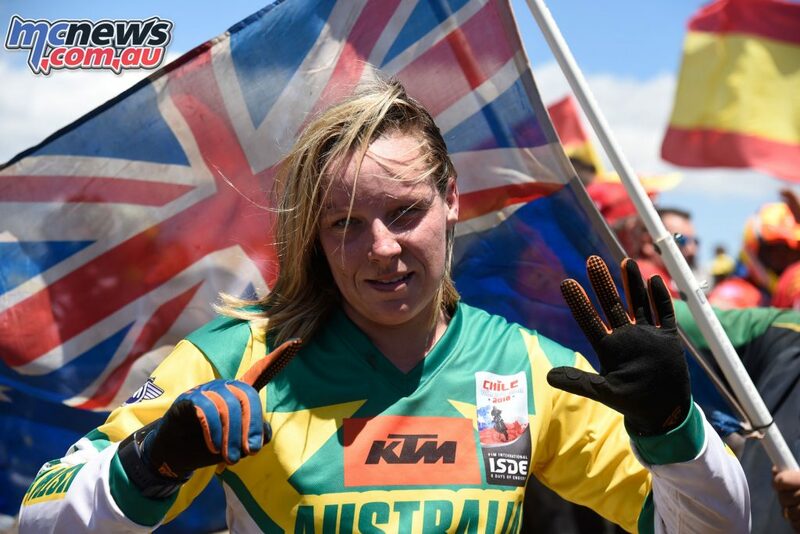 After five days of enduro racing in blinding dust and stifling heat, day six presented the ladies with a short and fast motocross circuit and it was 2018 GNCC champion Tayla Jones who clocked in the fastest time for Team Australia of 10:23.76, leaving not a shadow of a doubt as to her rightful place as first overall in the class. Jessica Gardiner clocked in the second fastest time of 11:21.54, which has secured her place as fourth overall behind Livia Lancelot from Team France and Brandy Richards from Team USA. 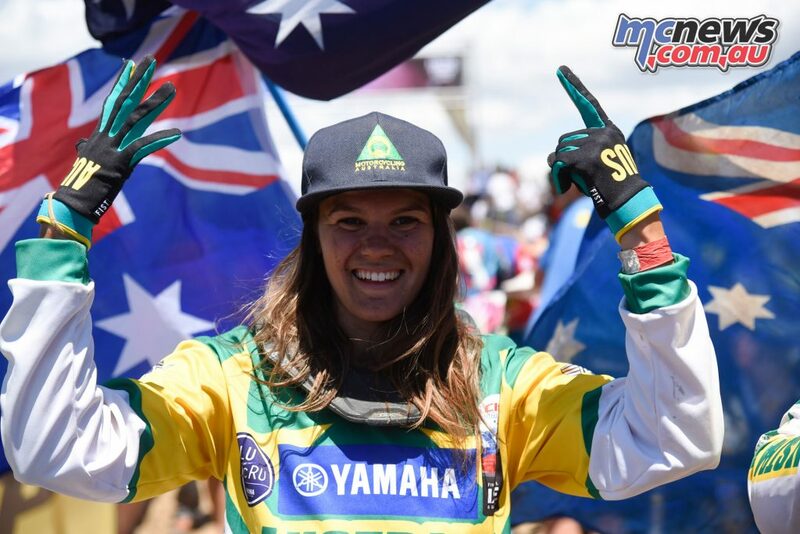 With a first time ISDE Women’s World Trophy title under her belt, Mackenzie Tricker was elated to be part of Team Australia’s dominance of ISDE 2018. 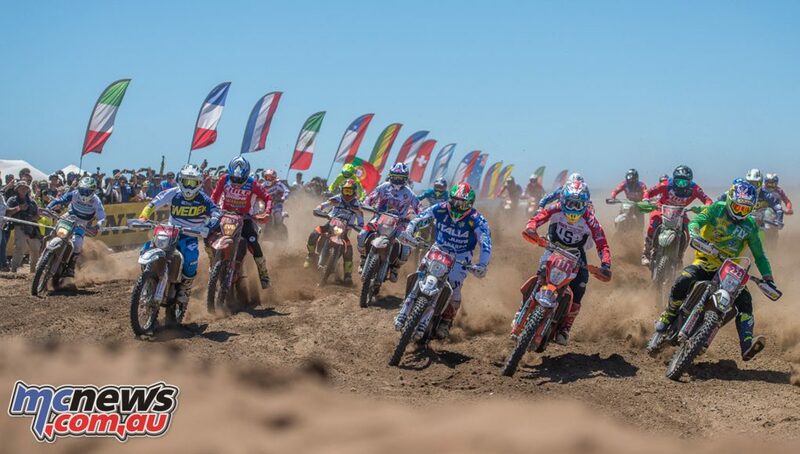 The Italian team of Andrea Verona (TM), Matteo Cavallo (Beta) and Davide Soreca (TM) ended a ten-year winless streak to take out the 2018 FIM Junior World Trophy championship ahead of the USA, France, Chile, Australia and Sweden. Despite having to push his bike over the line at the final motocross test, Fraser Higlet was the best of the Australia’s Junior riders with a ninth in the E1 class and a more than credible 38th outright while Andrew Wilksch and Thomas Mason battled through the never-ending dust to finish 49th and 51st respectively out of the 82 finishers. 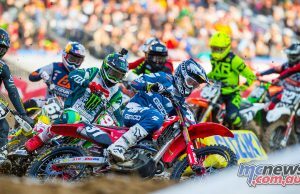 In his debut at the event and just a week after winning AUS-X Open in Sydney, reigning US Supercross champion Jason Anderson has been crowned King of Bercy in Paris last weekend while Dylan Ferrandis got a huge support from the fans to get a podium result between Anderson and Zach Osborne. 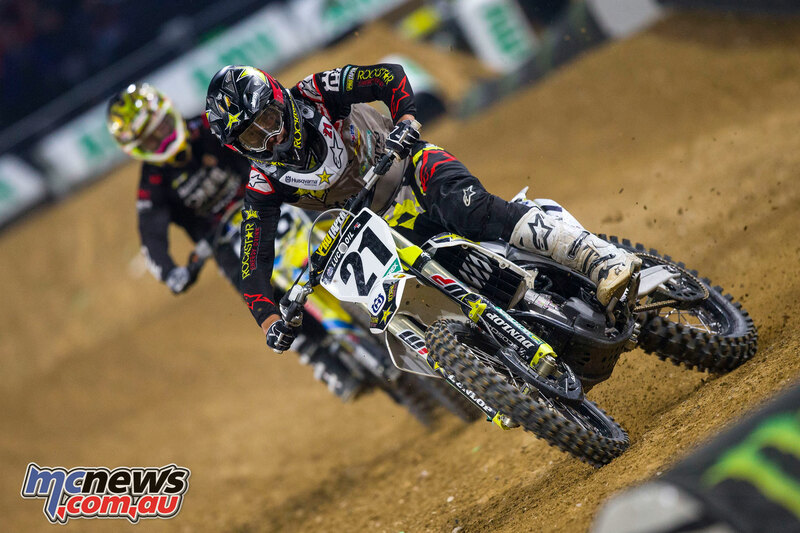 Jason Anderson dominated the French Supercross, just missing two wins in the six races ever the two nights of racing after French hero Dylan Ferrandis won the second race on Saturday night before teammate Zach Osborne won the first sprint race on Sunday. Just a month after winning the Marseille Supercross in his first race on a 450 since a long time, Dylan Ferrandis also confirmed his great shape as he got a podium result each night to finish runner up in the overall classification. Third overall Zach Osborne also got great results for one if his first race in the 450 class, but unfortunately lost all his chances with a puncture in the main event on Sunday while fourth and fifth went to Honda teammates Vince Friese and Justin Brayton who also helped the US Team to win the Nations classification,a win the riders dedicated to Weston Peick who was injured on Saturday. Americans also dominate the SX2 category with the new Prince of Paris in Jace Own who won three races and was runner up in the three others (1/2/1 and 2/1/2) while AUS-X SX2 class winner Cameron McAdoo (4/1/3 and 3/2/5) took out second place ahead of Frenchmen Adrien Escoffier (2/4/2 and 5/3/3) and Thomas Do (6/3/6 and 6/4/1). 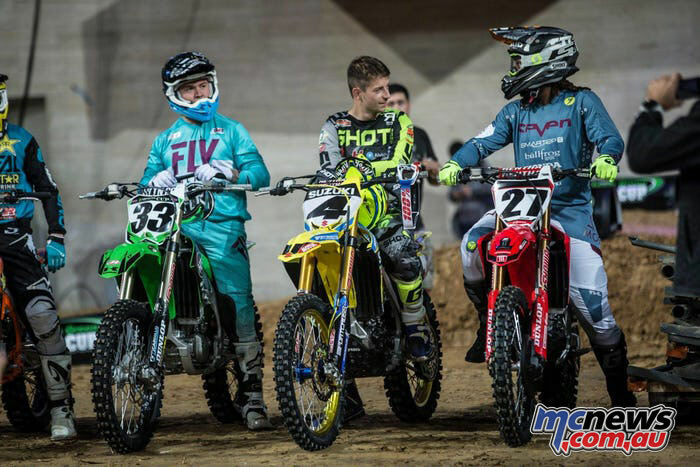 In the Triple Crown-style format (three main events) at the Barcelona Supercross it was Josh Grant who won the first two and finished second in the third to take the overall by one point over Stewart, who went 2-2-1 while Charles LeFrancois finished third overall. 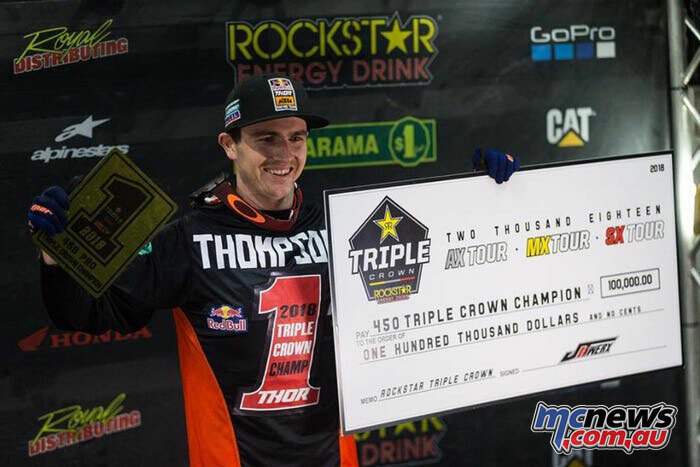 The final round of the supercross portion of the inaugural Rockstar Energy Triple Crown Championship wrapped up last Saturday night in Hamilton, Canada and it was Cole Thompson and Jess Pettis who wrapped up the SX1 and SX2 championships respectively. 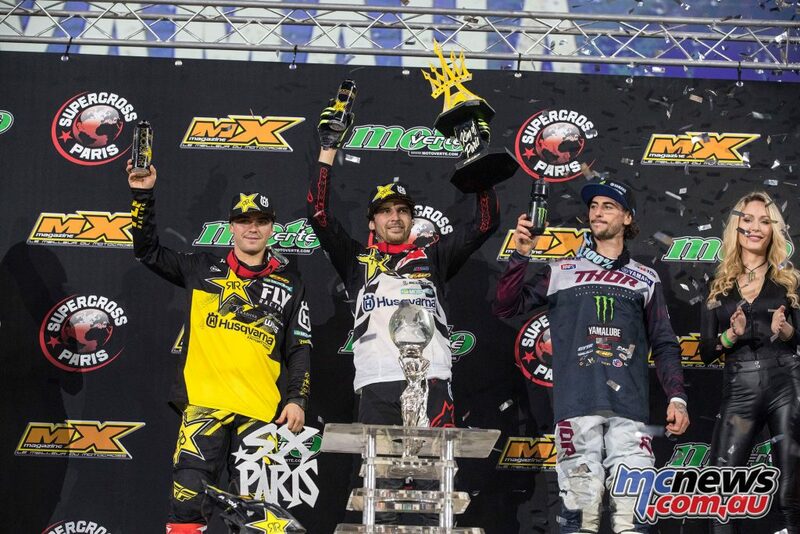 Cole Thompson, who already claimed the $100,000 as the overall series winner, won the SX1 main event and the supercross title with Phil Nicoletti and Matt Goerke filling the podium while in the SX2 class Shawn Maffenbeier claimed the win over Tanner Ward and the new champion Jess Pettis. The 2019 World MX2 Motocross Championships will have two new faces on the start grid in 2019 with second generation French rider Tom Vialle and Aussie talent Mitch Evans signing with separate teams last week. 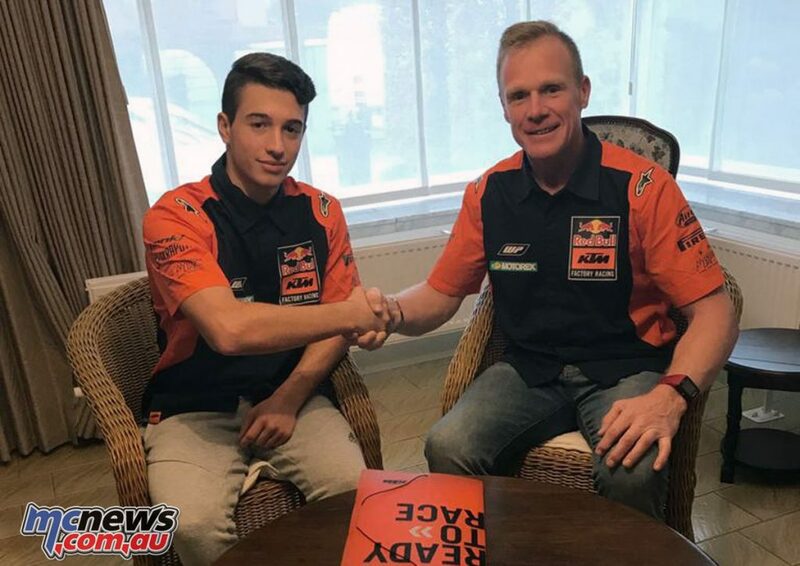 Vialle, son of former GP winner and title contender Frederic, will join World Champion Jorge Prado on the factory KTM 250 SX-F after a moto victory, five top-three race finishes and three podiums in the 2018 EMX250 European Championship. 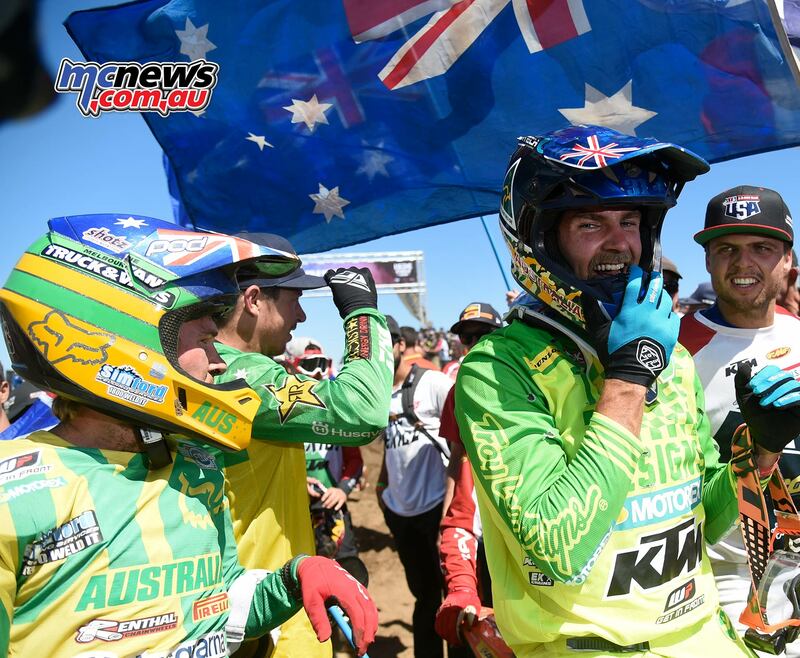 Evans finished second to Dean Ferris in this years Australian MX Nationals before turning heads at the MXoN at Red Bud with 10-14 moto finishes for 8th outright in the Open class which has reportedly landed the Aussie with a ride with the same team that Hunter Lawrence rode for this year. Max Nagl is back where it all started at the beginning of his long and successful career with a German star returning to the Sarholtz KTM racing team for the 2019 MXGP Championships and the ADAC MX Masters. HIMX are delighted to announce that they have signed factory Red Bull KTM rider and 2018 MX1 World Champion Jeffrey Herlings for the Be Wiser – Bridgestone Hawkstone International on the 17th February 2019. “Getting Jeffrey back to our event as World Champion is fantastic news. 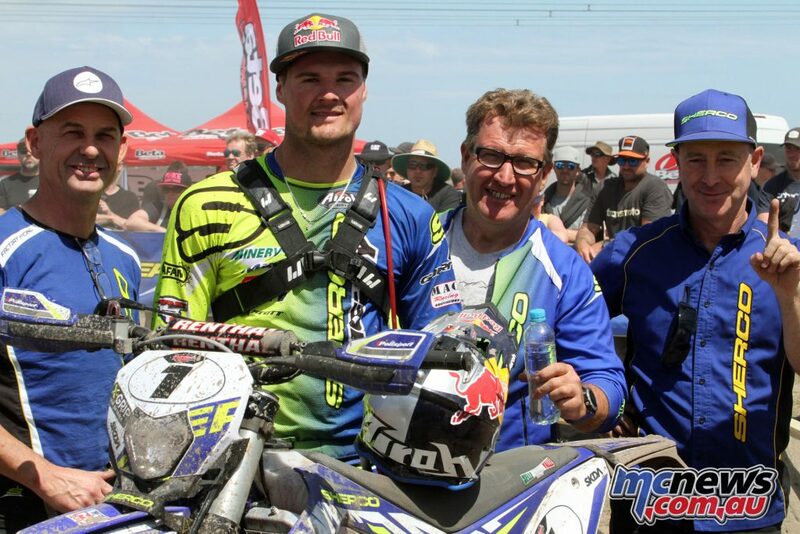 He’s always been a big supporter of Hawkstone and it is great he will be back in February. 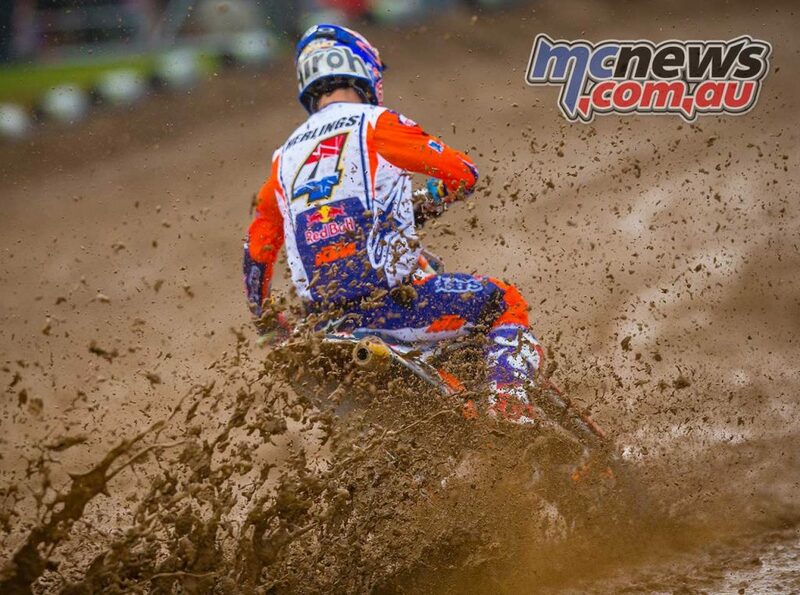 He always puts on a good show whenever he comes to Hawkstone Park and it is great news for the fans. 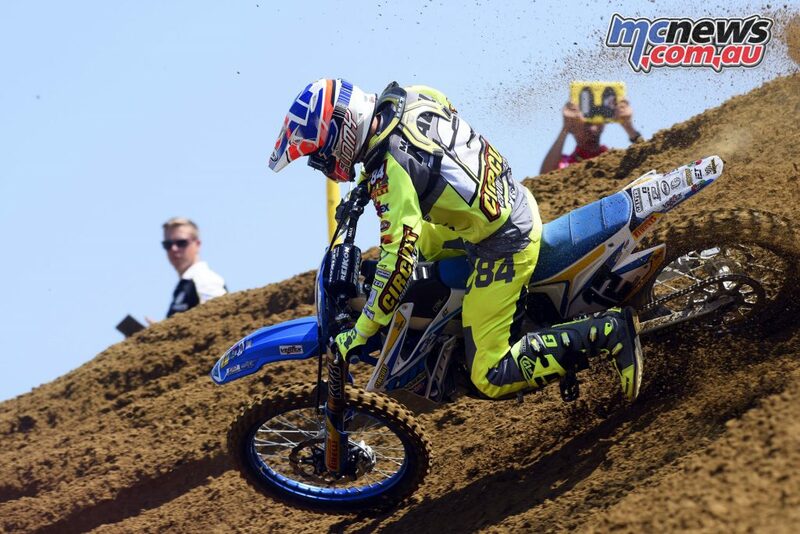 Also confirmed are Brits Tommy Searle and Max Anstie plus Rockstar Husqvarna riders Jed Beaton and Thomas Kjer Olsen. 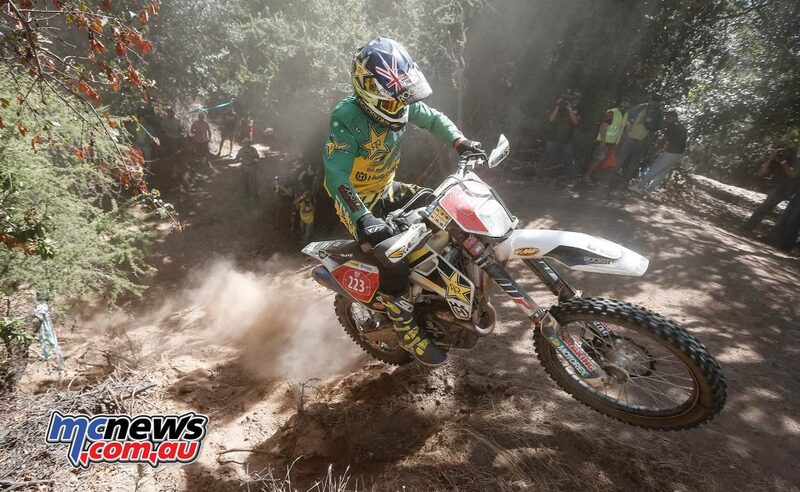 It’s been a huge year for extreme enduro star Wade Young with victories at prestigious events including Red Bull Romaniacs, Megawatt and Sea To Sky. 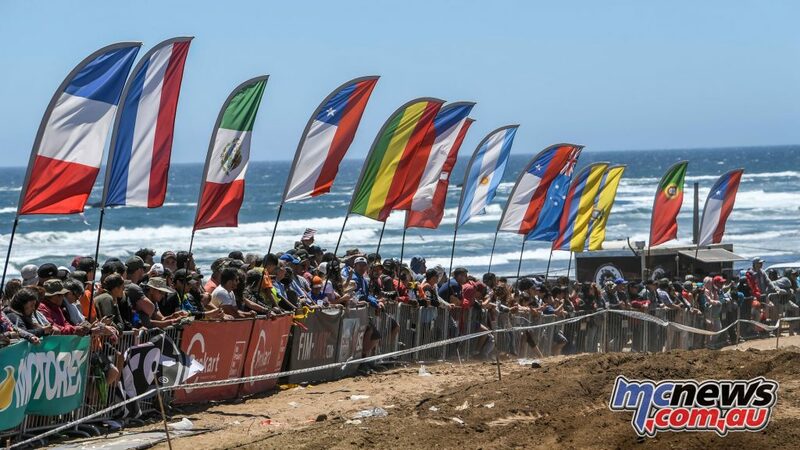 Young’s recent victory at the Wildwood Rock Extreme in Melbourne saw thousands of fans witness the South African decimate the competition. 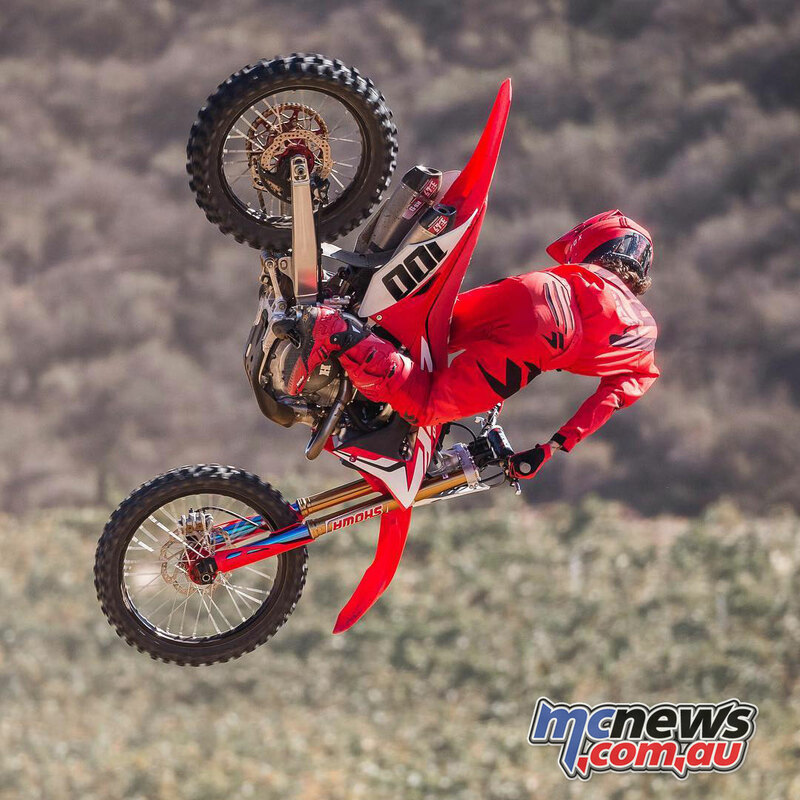 With the inaugural 2018 Monster Energy S-X Open Auckland just days away, Californian style master Josh Hansen, has been confirmed to race in the coveted SX1 Class and is prepared to take on the World’s best inside Mt Smart Stadium on November 24. 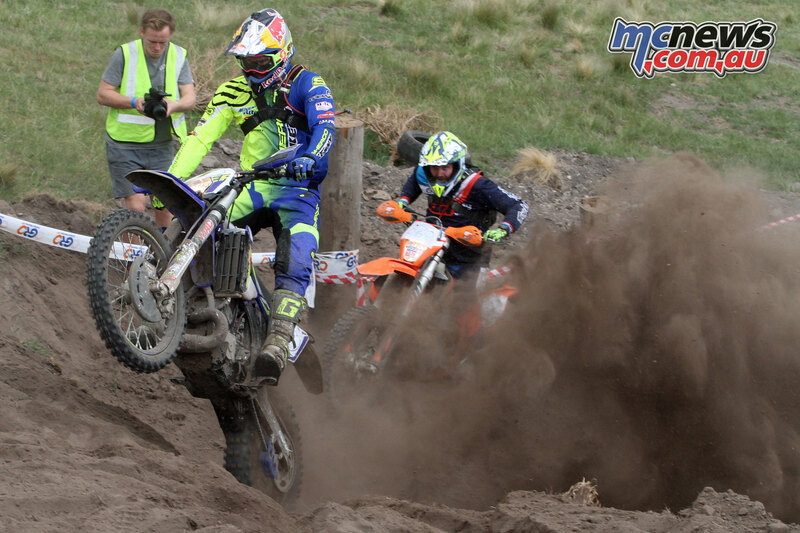 New Zealand has been a happy hunting ground for Hansen; as he captured his maiden Australian Supercross Championship race win there in 2009, which later would translate into a championship-winning year. For 2018, Hansen is thrilled to be back in NZ and ready to race the world’s best. 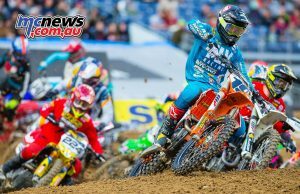 Defending King of Paris, Marvin Musquin was forced to sit out last weekend’s Paris Supercross after picking up a knee injury. Below is a press release from the event organizers. 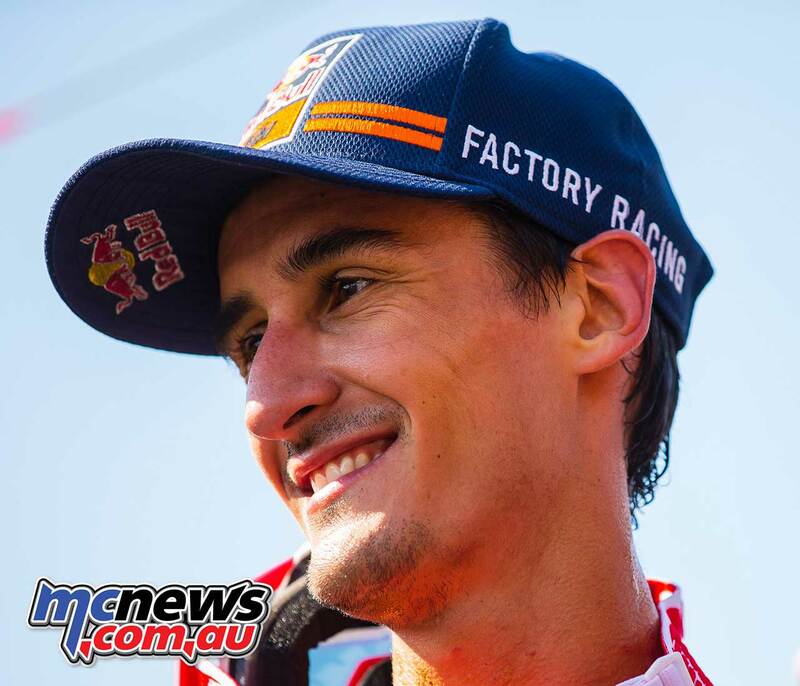 “While he was conducting a final testing session before his departure for France and the big meeting of the Arena Paris-La Defense this weekend, Marvin Musquin unfortunately suffered a knee injury that has forced to withdraw! 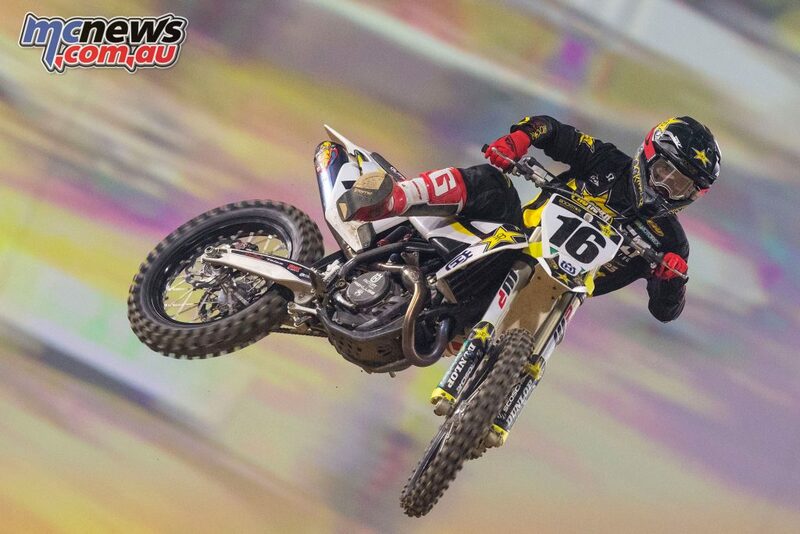 The organizers made a last-minute replacement with Weston Peick and Justin Hill. “It was an obviously disappointed Marvin who made the news to the organizers: the prospect of being able to challenge the World Champion, Jason Anderson, for once on the soil of his country, was a challenge that was particularly close to his heart. The exact severity of the injury is not yet known and Marvin needs to consult his trusted doctor before knowing how much it will impact his program beyond the Paris Supercross. Weston Peick is currently in a local hospital in France after a serious crash at the Paris Supercross where the stocky American collided with Dylan Ferrandis in the third SX1 main event and went down and was then landed on by Cedric Soubeyras. Peick was immediately taken to the hospital and according to local sources has facial injuries that will more than likely need surgery. Indian announced its 2019 team with Jared Mees, who has won the last two AFT Twins Championships with Indian ready to do battle once again this time with brothers Briar and Bronson Bauman as his teammates while Brad Baker, who was paralysed in a practice crash at X Games last year, returns to the team as technical advisor and rider coach. 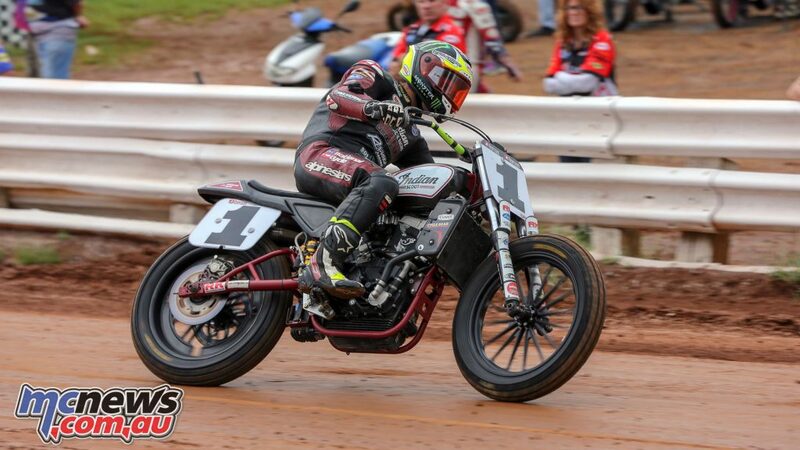 AFT has announced new rules for the 2019 season that would benefit a production-based machine that can now be bored-and-stroked to 900cc instead of 750, and they can run larger throttle bodies. Indian is okay with the larger displacement, but not happy with the new throttle body rule. Indian take serious issue with the third rule change – allowing production engines to increase from 38mm throttle bodies to 40mm. This rule excludes Indian Motorcycle Racing, because the Scout FTR750 is not a street legal production motorcycle. 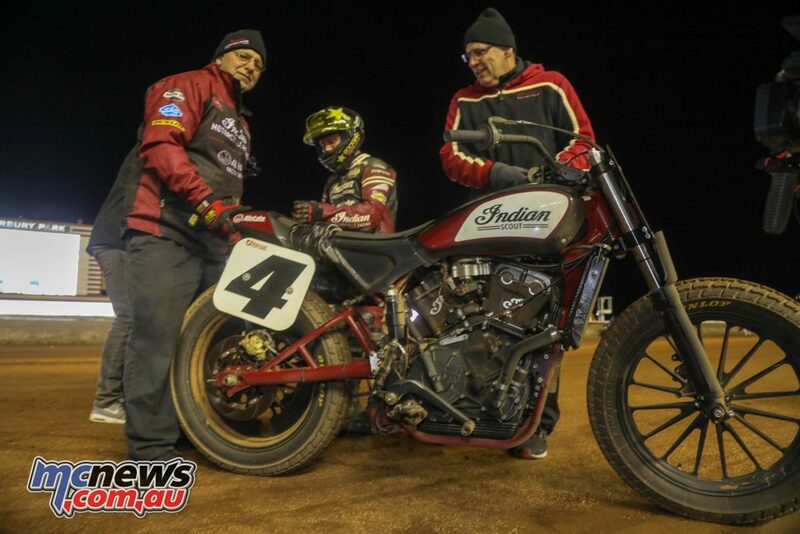 Not only does the rule singularly handicap Indian Motorcycle, it represents a significant impairment of our ability to compete on an equal level with every other team in the paddock, specifically on mile tracks. 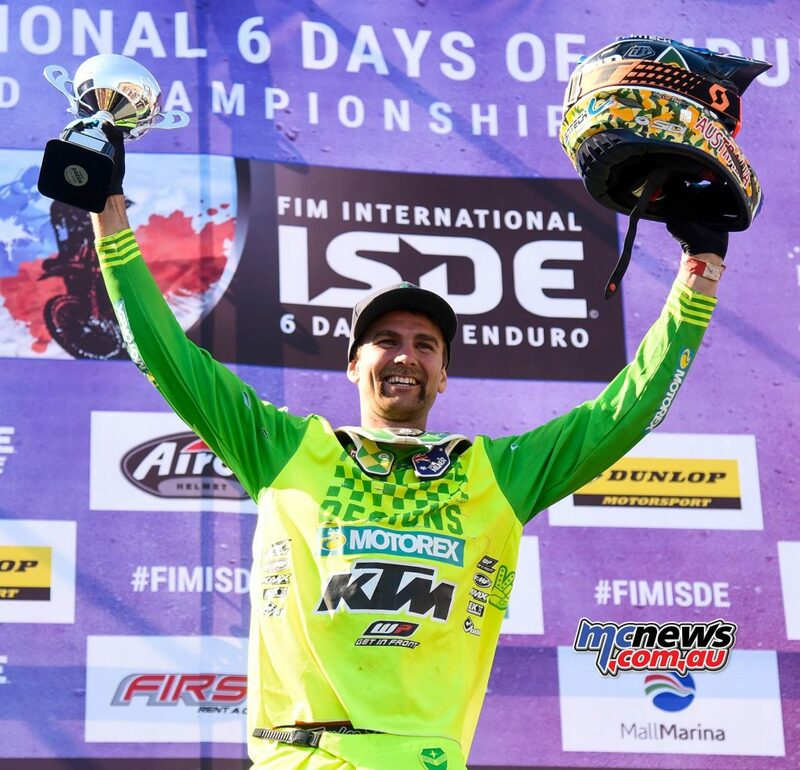 With winning celebrations now complete at the 2018 FIM International Six Days Enduro (ISDE) in Chile, plans are already in place for the 2019 edition in Portugal. With its large, purpose-built facility, the international motor racing circuit will act as the paddock and centre hub of activity for the race while utilising the surrounding mountainsides, three unique routes will be laid out incorporating a wide range of terrain for riders to contest. 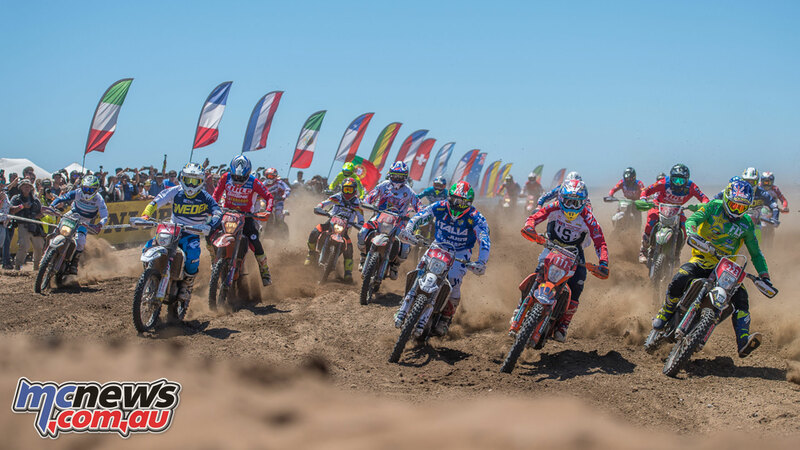 With the official date yet to be confirmed, the ninety-fourth edition of the FIM ISDE is expected to be held between late October and early November.